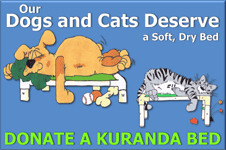 * Manure forks & "pooper-scoopers"
Help us pay the veterinarian or spay/neuter clinic! If you want to help out financially and aren't sure what to do, you can make a direct payment toward our bill at the veterinary clinics. We use Mission Veterinary Hospital (956-585-1656) and N 10th Street Animal Hospital (956-467-5776) for routine care and emergencies. We use the Weekend Vet (956-370-3600) in Brownsville for spay/neuter surgeries. Any money credited to our account at these locations would be greatly appreciated. We are selling donated items on ebay in order to generate funds to help support the program. If you have anything that would fit into a "Priority" mailing box and would like to donate it to Cinderella for resale, it could be a tax deductible donation for you and a source of income for CPR. That means that more animals can be helped. Registering with iGive.com and using the search engine can help benefit CPR whenever you search the web. And when you buy products online many companies donate a percentage to the cause of your choice. Please make sure the "cause" you select is Cinderella Pet Rescue. Amazon Smile is another way you can help support the animals just by choosing Cinderella Pet Rescue as your selected charity to benefit. It costs you nothing but a small percentage of your purchases is sent to Cinderella every quarter. So start using Amazon Smile, it is the same Amazon, just with the bonus of charitable support.